This month, IDP joined activists, elected officials, and its Immigrant Justice Network partners (Immigrant Legal Resource Center and National Immigration Project of the National Lawyers Guild) in Washington DC for Immigrants Speak Out: Day of Resistance Against Criminalization and Anti-immigrant Bills. There is still much work to be done to educate Members of Congress on how our immigration laws criminalize immigrants and harm families and communities, especially in the face of an Administration perversely invested in turning the power of a deeply flawed criminal justice system against immigrants; Immigrants Speak Out sought to expedite that process by bringing directly impacted immigrant leaders and Members of Congress face to face. Alejandra was just a teenager with a few youthful offenses and a green card. She was separated from her family and thrown into an immigration jail for two years. Roland was enjoying a cruise with his family. He was detained for signing the wrong name on a speeding ticket years ago. Khalil was a young man trying to support his family while finishing his Master’s Degree. ICE raided his home and arrested him in front of his children for a prior arrest he had already served time for. Escaping a violent situation, Jeanette built a new life for herself in Colorado. That was all threatened when she was stopped while driving without a license. Erick was accused of gang affiliation. Though the accusations were false, he still lost his DACA status. All Daisy’s father wanted to do was reunite with his family. Today, he’s sitting in a federal jail awaiting criminal charges for crossing the border to see his kids. These are just some of countless harrowing stories that directly impacted immigrant leaders shared with Members of Congress last week as part of a briefing and Hill visits asking legislators to resist and repeal anti-immigrant laws that criminalize communities. We came to the Hill after the midterms, where we saw a slate of candidates across the country run with some of the worst immigrant hate-mongering tactics of the Trump administration, only to be amplified at the national level by the President. At the same time, there was a groundswell of activism and progressive candidates grounding their campaigns in values of dignity and human rights for all. For the most part, the former failed while the latter triumphed. 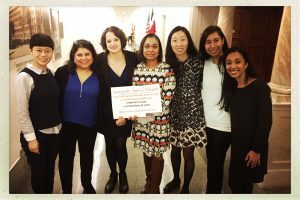 Ahead of the December Appropriations Committee deadline, the congressional briefing brought together those who are most impacted by harsh immigration policies to speak to members of Congress, to share their experiences, to ask legislators to resist and repeal anti-immigrant laws that criminalize communities, and to offer solutions that will make a difference. The briefing addressed a number of pending anti-immigrant bills specifically, including proposed legislation like the bill introduced by Representative Kevin McCarthy, which would allocate $25B in taxpayer dollars to fund an expansion of the border wall. Anti-immigrant bills, such as this one , expand the criminalization of immigrants by increasing unlawful entry and reentry prosecutions, penalize jurisdictions across the country for implementing sanctuary policies, and expand grounds of deportation–further devastating immigrant communities. IDP and our IJN partners plan to continue working with directly impacted immigrant leaders and Members of Congress to fight back against harsh proposed bills, to defund Trump’s hateful deportation agenda, and towards policies that uphold justice and human rights for all. On a semi-related note, the last few weeks have been very intense. Now former-Attorney General Jeff Sessions was forced to resign, and while it’s clear that this was forced for suspicious anti-democratic purposes, we certainly will not miss a strong advocate for the Trump Administration’s anti-immigrant rhetoric and policies. Anti-immigrant ads don’t work as well as the GOP would have hoped! Candidates who faced well-funded anti-immigrant attack ads won several races, including Sharice Davids (KS-03), Ann Kirkpatrick (AZ-02), Antonio Delgado (NY-19), Anthony Brindisi (NY-22), Abigail Spanberger (VA-07), Abby Finkenauer (IA-01), and Cindy Axne (IA-03). A Gubernatorial Win! Democrats picked up 8 Governor’s seats, which bodes well for the expansion and possibility of success of our new Immigrant Clemency Project. Bye! Kris Kobach, Secretary of State of Kansas, lost his race for the Governor’s seat. Koback is the notorious architect of a number of anti-immigrant policies. Love wins! Barbara Comstock and Dave Brat, who both made anti-immigrant fear-mongering and hardline immigration policies central to their campaigns, both lost their House races. This election has shown in multiple races, that hateful rhetoric is an increasingly losing strategy. Shut out! An anti-sanctuary ballot initiative in Oregon lost by an unexpectedly large margin. Some diversity – it’s about time. Newly-elected Congresspeople represent the most diverse incoming class ever elected on the basis of race, gender, and immigration history, with people having immigrated, or been born to immigrants from, Lebanon, Eritrea, Ireland, and Somalia, among other places. We hope that these new Congresspeople will play a role in checking some of the worst criminalization and deportation policies pushed by Trump. A flip! Democrats flipped the State Senate in New York, and now have a large margin thanks to significant turnout in communities of color. This bodes well for us, as a number of progressive policies IDP has contributed to have been stalled in the Senate for years. Despite all of these victories, there is still much work to be done to advance our values of justice and human rights for all. It is our hope that our work to educate Congresspeople, through initiatives like the Immigrant Justice Network and campaigns and events like Immigrants Speak Out, will be more effective in light of these recent victories. Our fight to bring to light the ways our immigration laws criminalize immigrants and harm families and communities, particularly under an administration hell-bent on turning the power of a destructive system against immigrants, is not over and we hope that tomorrow looks a bit brighter than today.